First off, cults. This is a subject of great interest to me. My first semester of college, I did a massive research project on them – particularly ones that stalk college campuses. I don’t think there is enough widespread awareness about the danger and seductive power that these groups have at their command. This holds even more true for small, mostly informal ones like the one featured in this book. So – bravo to Denise Jaden for writing about one. 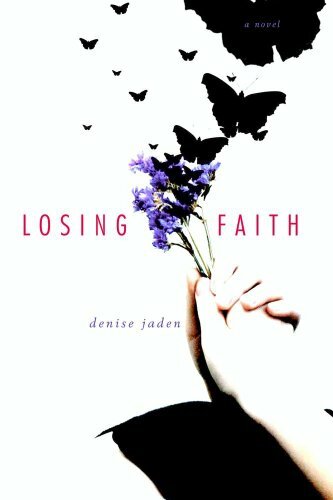 Faith was by far the most complex and intriguing character, and even though she wasn’t an active part of the majority of the story, she is definitely what kept the plot moving. All the other characters seemed to fall into the roles they played and remained somewhat to mostly one-dimensional. My main complaint is the feeling of disconnect between the issues the characters faced and the characters themselves. Alis had one effed up sister – but after meeting Brie, she was always his main focus. I don’t think there was enough Reena/Alis tension. Same goes for Tessa and her dad (although I did like Tessa a lot). I just don’t feel like most of the relationships found within the book were portrayed very realistically. That being said, the book is worth reading for subject alone. I’m all for cult awareness, and the plot is very original and intense – it remains captivating from start to finish. So, even though I have problems with character development – I think this book is very much worth picking up. I read this one a while ago and liked it, but didn't love it. I totally get what you mean about character/relationship development, but thought the overall message and feel to the story was a good one.